Seniors Can Still Bulk Up On Muscle By Pressing Iron Our muscle mass decreases at surprising rates as we get older. But researchers found that people older than 50 can not only maintain but actually increase their muscle mass by lifting weights. 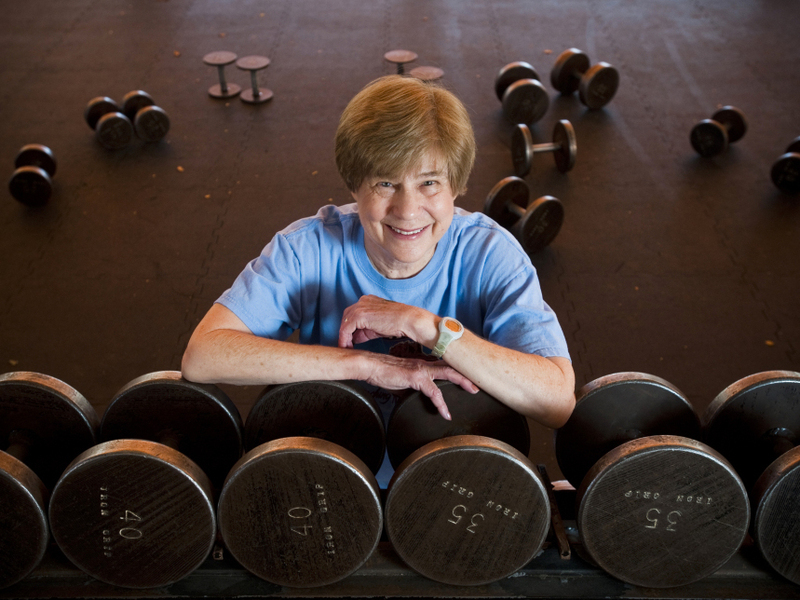 Sandy Palais, 73, of Arizona started lifting weights about 10 years ago after she was diagnosed with osteoporosis. As we age, our muscle mass decreases at surprising rates. According to Dr. David Heber, director of UCLA's Center for Human Nutrition, an average male who weights 180 pounds might after age 60 lose as much as 10 pounds of muscle mass over a decade. But can we turn that around? In fact, new research published in the journal Medicine & Science In Sports & Exercise finds older adults who begin lifting weights after 50 may win the battle against age-related muscle loss. Palais started weight training to build bone mass. But she built muscle mass as well. "You have to do what we call resistance exercise," Heber says. This can take a lot of different forms. "It could be lifting weights, it could be stretchy bands, but the key is you have to stretch a muscle." When you stretch a muscle to the point of straining it, as is the goal during weight lifting, you set in motion the body's natural muscle-building response. The muscle has to adapt to the damage and build itself up to be prepared for the next weightlifting assault. In this way, muscles build fiber and actually increase in size. 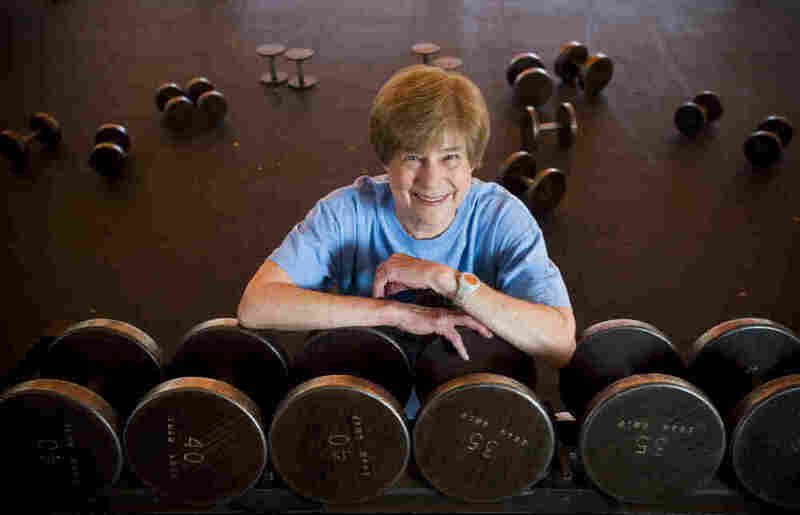 Take the success story of 73-year-old Sandy Palais of Tempe, Ariz., who does resistance training six days a week for about an hour each day. Palais started lifting weights about 10 years ago, shortly after she was diagnosed with osteoporosis. Weight training builds both muscle and bone mass. Palais started going to the gym three days a week. It didn't cost much, and student trainers were there to help. Within a year, she was able to compete in the local senior Olympics. "My top score was 380 pounds: I squatted 135; I benched 80; and I deadlifted 165," she says, laughing. Now Palais has a drawer full of silver and gold medals. 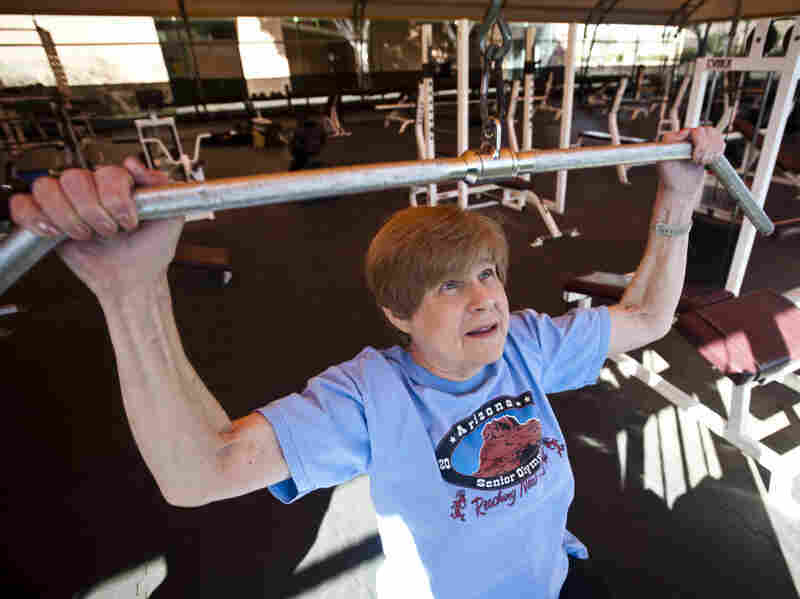 "I feel strong," says Palais, who was able to compete in the local senior Olympics. Exercise physiologist and researcher Mark Peterson first met Palais when he was a student trainer at Arizona State University. Now, Peterson works at the University of Michigan where he authored the new research published in Medicine & Science In Sports & Exercise that looked at whether older people can reverse the process of muscle loss. 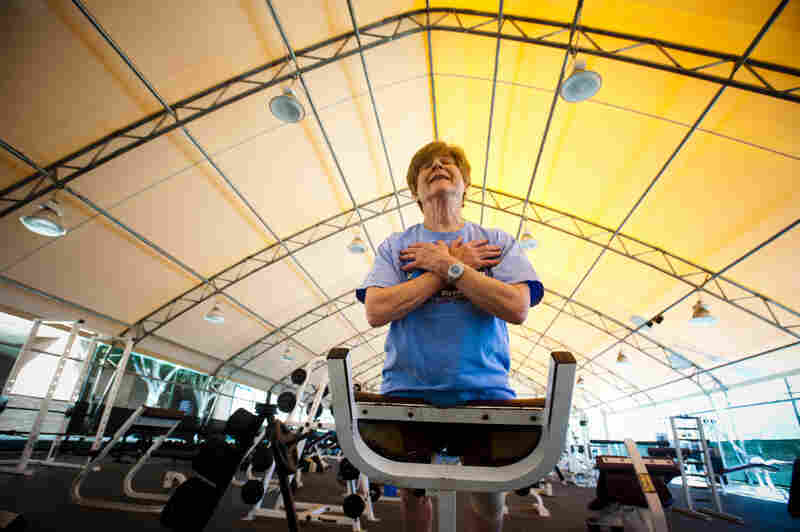 "The time in which we say that older adults can't do more exercise is long gone," he says. In Peterson's analysis of 39 studies, he found that among more than 1,300 adults over the age of 50, muscle mass could be increased by an average of nearly 2.5 pounds in just five months. Not only did that reverse any age-related muscle loss, it actually built lots of new muscle. Related research found the greater the intensity of weight-lifting programs, the more dramatic the outcomes. Adults who lifted the most weight boosted their upper and lower body strength by nearly a third. Muscle strength and balance help prevent falls, one of the most common reasons seniors end up in the hospital. For sedentary adults who resolve to take up weight lifting, Peterson suggests starting slowly. You could actually begin by simply getting in and out of a chair. He says the ability to stand up out of a chair is much compromised after the age of 65 if people don't take part in resistance training. So, using one's own body mass as a dead weight is a "reasonable way to start." Repeat that at least 10 times. Then, add repetitions and weights like small barbells as you become comfortable with the exercise. Increases of 5 pounds per weight are reasonable after mastering the lift, says Peterson. And, after exercising, don't forget to eat, adds Heber. If you don't, muscles could actually get beaten down and not have the building blocks to get bigger and stronger. Protein is essential, Heber says, adding that your best bets are chicken, fish, soy, beans and nuts like pistachios, walnuts and almonds. Palais says she thinks the extra effort she exerts is worth it. "I feel strong," she says. "I can lift the bags of groceries without too much sweat."